Standard units will have a ceiling height of eight feet. Mezzanine units are locker-sized units located above other lockers or full-sized units. They are usually accessed via ladder. Workspaces are designed for office or commercial use, and unfit for everyday storage. They are often climate-controlled with electrical outlets. To search for vehicle storage, select 'Vehicle - Covered' or 'Vehicle - Uncovered' in the Amenities drop-down menu. A designated parking spot or an unused space on the premises where you can park your vehicle. Outdoor spaces can be covered or uncovered. 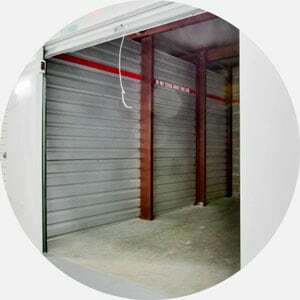 Some facilities offer regular storage units for your vehicle. If you go with this option, remember to find a unit with drive-up access. We recommend the sizes listed below. You should not try to fit your vehicle into a unit with a door less than ten feet wide. A breakdown of the most common amenities offered by storage facilities. The facility will maintain a safe temperature and humidity level for your unit. If you’re storing something temperature-sensitive or particularly valuable, climate control is a good idea. You can pull your moving truck or vehicle right up to the unit. This is rarely available for indoor units. Some facilities will let you rent their moving truck for free. Specific terms and restrictions will vary by facility (e.g., mileage limits, time limits, insurance requirements, refueling protocol). You have access to your unit at any time. Restrictions may apply—for example, your facility could require manager approval. Some facilities only allow business customers 24-hour access or may charge additional fees. Most facilities require you to bring your own lock, although many will sell locks onsite. We recommend closed-shackle padlocks, disc locks or cylinder locks. Standard or combination padlocks are easily picked and not recommended. Video camera surveillance, electronic gates and “fenced + lighted” can all increase the security of the facility. A manager who lives onsite means that someone will be on the premises during non-business hours. Making a reservation on SelfStorage.com ensures that the unit will be available when you’re ready to move in. On move-in day, simply show up at the facility with your confirmation email from SelfStorage.com (pulled up on your phone or printed out) and let them know that you’re a SelfStorage.com customer. Please bring a photo ID and a form of payment. You should also bring a copy of your homeowners insurance or renters insurance, which may save you from paying additional insurance fees. Insurance: Most facilities require proof of renters or homeowners insurance when you sign your paperwork and move in. You may also have the option to purchase insurance provided at the facility. Administrative fee: The admin fee is a common storage industry fee that covers the cost of signing up a new tenant. Security deposit: Some facilities will charge a security deposit upfront. This works in much the same way as a security deposit for an apartment rental. Please direct all move-out inquiries to your facility when you plan to move out. While storage leases are typically month-to-month, you will be required to give advanced notice of your move-out. Additionally, most facilities will not prorate your rent when moving out. Be sure to coordinate a move-out date with the facility to avoid paying for a full month. That’s it! On your scheduled move-out day, empty your unit and follow any additional procedures requested by the facility. Have questions about your storage needs? SelfStorage.com’s team can help—don’t hesitate to get in touch with us!